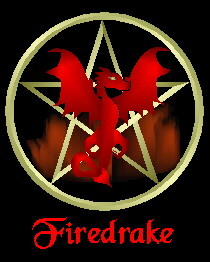 Firedrake's page of Mystical Stuff! UPDATED! 08/04/02 The long-awaited ABOUT ME page is in the works, check the link! And I've added 2 new tidbits of wisdom on the Nuggets page! More updates coming soon (see intro below)! Hello and welcome! This page is in rather sorry shape at the moment. I made it up, had big plans for it, got distracted, and forgot it existed for a year or so. Which is really pretty typical. The entire site is in for a major revision that I hope will be done by Yule. Until then, I'm keeping this rudimentary attempt up here to continue to enlighten and help people. Enjoy! Oh, and in spite of the seeming neglect, I'm still updating this site. It's not totally derilict. I blame my inner chaotic nature and my general lack of expressable knowledge for the slowness with which I update things. I'm also consulting with a friend who actually KNOWS this html stuff, and am hoping to learn how to do nifty things like frames soon, to make navigation easier. Finally, I'd also like everyone to know that I've informally decided to change my affiliation from "Wiccan" to "Druidic". All part of the growing, learning, maturing, and reading process! Here's what the page is about! The pithy hints of the wise! TERRIFIC site! It's the place that gave me my start into Wicca! Another wonderful site, with links to a ton of others, a directory of shops, covens, and individuals, a "basics" setion, a law section, a current events section.. basically your one-stop Witchcraft reference.